The fifth and final part of our retrospect of the concert tour to Poland, Czech republic and Slowakia. Winner of the Grand Prix as best Choir of competition in Kraków. Last Tuesday, we sang in a well-filled Pauluskirche in Basel. It was a wonderful concert and a good preparation for the concert tour to poland that starts next week. We released our new CD! 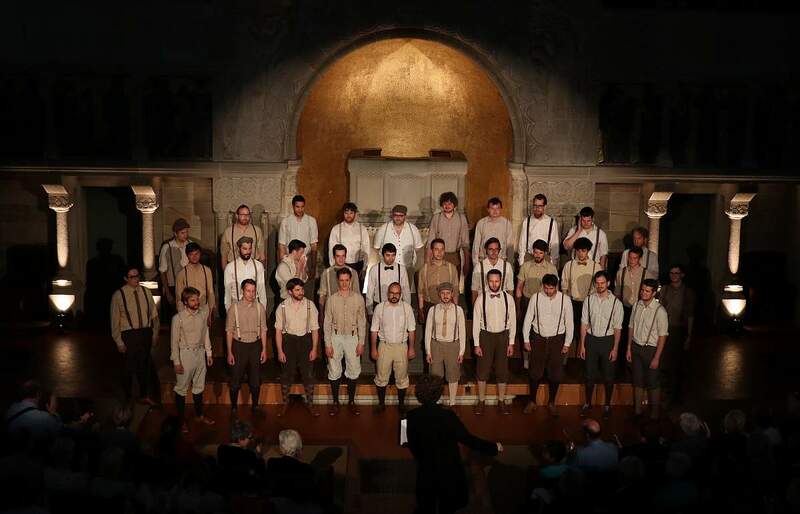 Concert tours of the Männerstimmen Basel aim to further the musical, social, and cultural qualities of our choir. We intend to promote Swiss music and Swiss composers at home, as well as abroad. The last day of our time in Iceland was reserved for some more classic tourism, after the Nordic choir Festival in Reykjavík had come to an end the day before. One of the highlights of our trip was the participation at the „Nordic-Baltic Male Choir Festival“ in Reykjavík, in which we were the only non-Nordic choir in a field of 23 male voice choirs from throughout the Nordic/Baltic area. It was time to journey on after the great time on the Faroe Islands. M/S Norröna, our ferry to Iceland, was moored in the harbour of Tórshavn. Exotic destinations were on the program for the Männerstimmen Basel concert tour of 2016: the Faroe Islands and Iceland! The two wonderful concerts last weekend were very popular with the crowd: the church St. Katharinen in Laufen as well as the Münster Basel were packed to capacity with eager concert goers – thank you all for coming! For the third time now, the Männerstimmen Basel organised the culinary concert „Amuse Bouche", during which the audience had the combined pleasure of pleasing the palate as well as the ear. In conclusion, the concert tour to the UK was a great experience and a musical success. After a successful tour of Cambridge-London-Oxford, we headed west to the beautiful county of Cornwall. Together with nearly 70 choirs from Canada, USA, Russia, Estonia, Germany, UK, and more countries, we participated in the largest international male choir festival held in Europe. After the phenomenal success at the Brandenburg Festival in London, we headed west to "the other place", as any proud Cantabrigian would call the second most famous academic institution in England. A short train ride from Cambridge brought us to the next stage of our tour - London! This year’s concert tour brought the Männerstimmen Basel across the English Channel to the United Kingdom. A long train journey from Basel via Paris and London to the famous University town <b>Cambridge</b> marked the beginning of our concert tour in the UK.